One of the most striking features of the terrible cycle of violence in Israel right now is a recurring disagreement about the facts. From the Israeli perspective, Palestinians are randomly stabbing Israelis, after which Israeli police or bystanders shoot the assailants to prevent further violence. From the Palestinian perspective, the shootings by Israelis are either unprovoked or disproportionate to the threats and therefore amount to extrajudicial killings. Another source of dispute is the concern that may be motivating some of the Palestinian attackers: the belief that Israel intends to exclude Palestinians from the Temple Mount, or Haram al-Sharif, and replace the Dome of the Rock and the Al-Aqsa Mosque with a Jewish temple. To most Israelis, the charge is preposterous. To some Palestinians, it seems plausible, notwithstanding the official government denials. Understanding such fundamental disputes about truth is difficult. It's very tempting to say one side is simply lying, and leave it at that. But Americans might be able to glean some insight into the otherwise foreign disputes by comparing them to a phenomenon we know better: racially based disagreement about the shootings of blacks by white police officers. The Ferguson, Missouri, case involving the shooting of Michael Brown by police officer Darren Wilson is the most obvious example: At one point, 64 per cent of blacks polled thought Officer Wilson was at fault, as opposed to 22 per cent of whites. The comparison suggests something about what's going on with the different views of Israelis and Palestinians. Several Israelis I know have told to me that they think the attacks are continuing because of falsehoods and misrepresentation spread by Palestinian leaders. There's certainly evidence for this claim, including Palestinian President Mahmoud Abbas' statement that one Palestinian boy had been "executed" by Israelis when he was in fact alive. But there's something almost too hopeful about attributing the attacks - and the beliefs that go along with them - to intentional distortion. It implies, quite wrongly, that if only the "facts" were known to them, isolated Palestinians wouldn't engage in attacks on Israelis. What's going on is much more complicated. Ambiguous evidence is being interpreted in the light of what people believe that they know about the world in which they live, based on their experiences, politics and values. In the United States context, blacks and whites diverge in their understandings of shootings like the one in Ferguson because they have different background perceptions of how the police operate. If you've experienced discriminatory treatment or know someone who has, you're much more likely to think the police have committed an unjustified shooting. If you identify with law enforcement and see them as protecting you, you're much more likely to side with the police. In the Israeli context, the videos of the shooting of Palestinians often don't show an initial attack. Israelis would no doubt say that this is because the attack happened so quickly that no one has yet bothered to start videotaping. Palestinians in turn might say that in some cases there was no attack at all. For each side, the interpretation reflects perspective. Israelis assume that their police wouldn't shoot unarmed Palestinians who hadn't attacked anyone. Many Israelis might be prepared to concede that sometimes police might make a mistake and shoot someone who only appeared to be reaching for a weapon or wielding one, but they would assume such cases were rare. Notice that this viewpoint reflects not only perspective, but also values: Israelis believe theirs is a democratic society in which the police enforce the law rather than break it. In contrast, Palestinians see themselves as living in a basic political structure of oppression, in a world where Israeli security services shoot first and ask questions later. Israel's occupation means that many Palestinians go through checkpoints daily, where armed Israeli soldiers or police scrutinise them. They understand individual Palestinians not to be armed because, as a people, the Palestinians are not armed in the way the Israelis are. The same is true of the controversy over the Temple Mount. 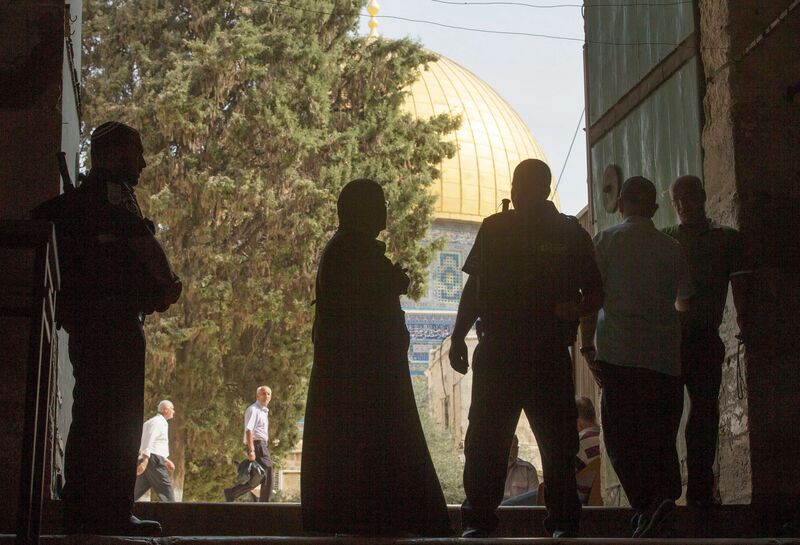 Only a tiny fringe of Israelis advocates building the Third Temple now, and so to most Israelis, the allegation that there is a plan to do so seems obviously paranoid. Yet to Palestinians, the existence of that Jewish fringe serves as evidence that a secret plan might exist. More Orthodox Jews than in the past consider it permissible to pray on the Temple Mount and go there for that purpose. To Palestinians, the occasional presence of these religious Jews is a message about where things might go in the future. When they say Al-Aqsa is in jeopardy, it's a reflection of their values as well as their perspective. It emerges that ascertaining facts isn't as simple as we like to believe. To be clear, this isn't relativism. Facts are real, and can be true or false. But how we determine those facts is highly inflected by our circumstances - which can lead to interpretations that seem crazy to the other side. The solution to such situations - assuming anyone wants one - requires each side to consider why the "facts" look so different from the other angle. It's easy to say, "I'm right, and you're a liar." That will get you nowhere, unless your goal is to deepen the disagreement. It's much harder to say, "I see why you might understand things in that way. Here's how we disagree." That statement might just be the beginning of a productive dialogue.